Be patient when using the cards. They are in alphabetical order by name of registrant, but the rolls of cards are not currently in alphabetical order on the FamilySearch catalog. You will need to find the appropriate set of cards that contains the name of interest. The “guide cards” were created by manually transcribing the cards. There may be errors. In the illustration, it appeared that the cards went from a roll the ended with Earl Trarer to one that began with Ernest Traver. That left no apparent roll that would contain Trautvetter. It turned out that the card that looked like Earl Trarer actually said Traver when it was looked at. Those who wish to search the cards can find a link to the direct FamilySearch catalog page on our “Search Tip of the Day” site. 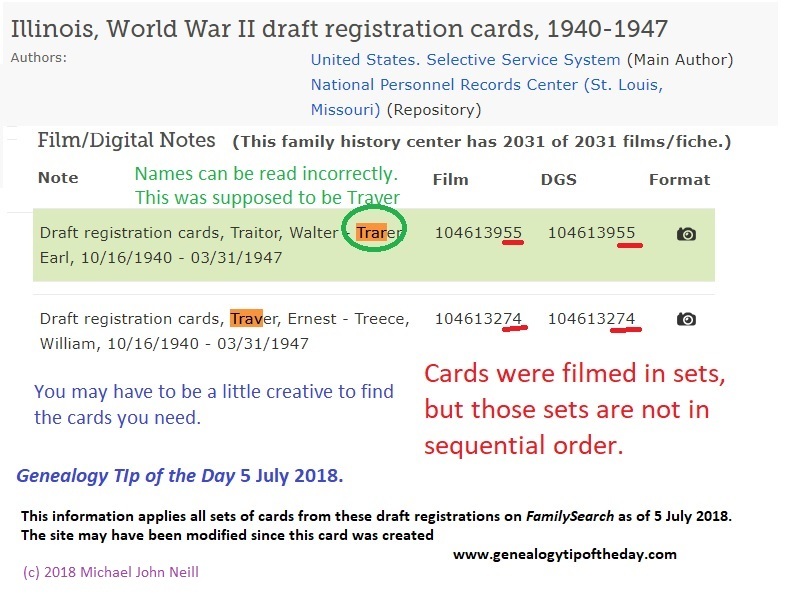 Thanks so much for the “heads up” regarding the WWII draft registration cards and especially for providing the direct link to the catalog – I was very quickly able to locate the cards of my maternal grandfather and his brother in Iowa and look forward to following up on other relatives! You are welcome! Glad you made some discoveries. Thanks for the tips. 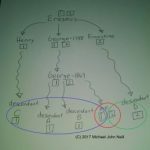 I’ve had good luck finding what I want by navigating to the state of interest, and then doing a CTL-F and typing in the first two or three letters of the Surname of interest. This has helped me narrow down the list of rolls quickly. I’ve noticed that some cards have a card with multiple addresses following; I assume that changes of address were tracked. On my father’s card, the residence address is typed in, and then the street address is lined out and a second addess is penciled, in a different city. Is it likely that is a change of address that was recorded? I’ve seen address changes written on the card and other times I’ve seen a separate card right after the draft card that contained the new address. In one instance I saw a copy of a birth record for a man who thought he was one year younger than he actually was. That CTL-F approach is what I’ve usually used as well. It works pretty well–except for the occasional last name. In Illinois, I had a devil of a time finding Trautvetter and Ufkes–but others have been really easy.